The Kalorik Stick Mixer quickly purees, blends, and mixes batters, beverages, and more. The unit's stainless-steel blade provides extremely smooth and even blending, while its protective blade guard helps prevent splattering. The mixer offers one-handed operation with its lightweight design, easy-to-grip ergonomic handle, and simple push-button controls. In addition, its long shaft reaches into pots, pitchers, and bowls for extended blending options, eliminating the need to dirty extra dishes. For quick clean-up, the blender's detachable shaft is dishwasher safe and the smooth surface of the blender body wipes clean with a damp cloth. A durable, plastic mixing cup with measuring marks is also included. Brita makes it easy to drink healthier, great tasting water for pennies per litre. Brita Space Saver Water Filter Pitcher is BPA free, and reduces zinc, chlorine taste and odour, copper, mercury and cadmium, all of which may be commonly found in tap water. For optimal performance, use the filter indicator to track when to replace the advanced filter. Its 6 cup capacity makes this pitcher perfect for your home or office. Its space saving size makes it perfect for smaller refrigerators, dorm rooms and offices. Plus one water filter can replace up to 300 standard 500 millilitre plastic water bottles, cutting down on waste and saving you money. Get great taste, less waste and more savings from Brita. Make quick work of everyday food-prepping tasks in the kitchen with the help of the Danby instant-pulse electric food chopper. Equipped with a powerful 200-watt motor, this surprisingly strong chopper offers a large 4-cup (1 litre) capacity glass work bowl with built-in measuring scale and razor sharp stainless steel chopping blades allowing you to chop, shred, and grind with ease. An easy pulse button provides ultimate control so you can achieve better, more precise chopping results. Chop vegetables & herbs neatly with no mess, shred soft cheese in seconds, or grind hard nuts with no effort. The stylish dark blue finish will look great on your countertop and dishwasher-safe parts make clean-up a snap. Ecohouzng Electric Stand Blender lets you mix fruits and vegetables with ease and allows you to make smoothies and drinks to share with friends and family members on special events, durable material drive system prevents wear and tear for long term durability and easy to storage with its compact design, whether it's party time, breakfast time, or just about anytime, you can use this electric blender to mix your food. 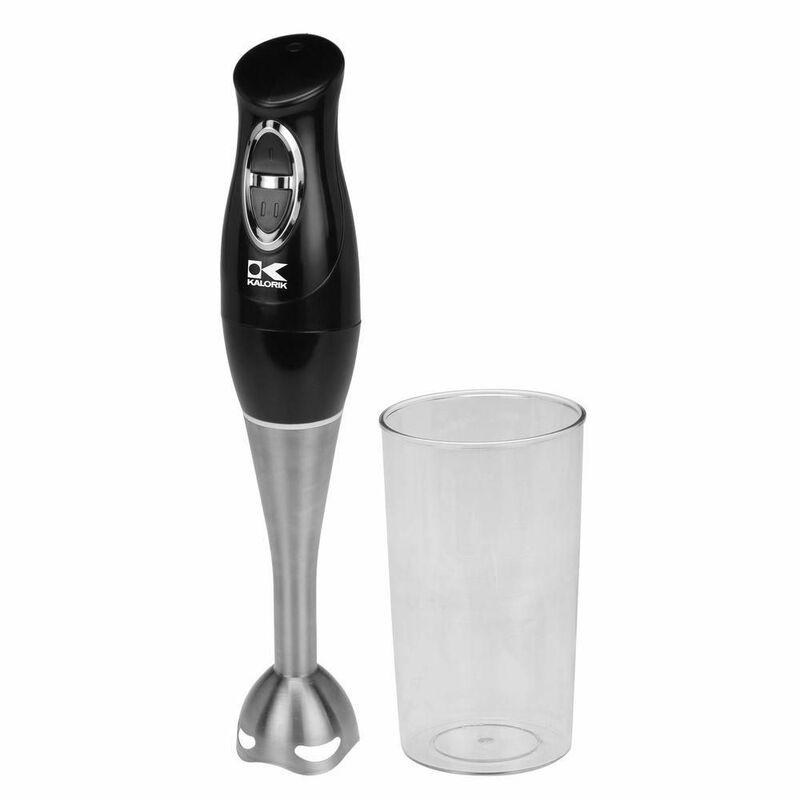 Immersion Blender and Mixing Cup in Black and Stainless Steel The Kalorik Stick Mixer quickly purees, blends, and mixes batters, beverages, and more. The unit's stainless-steel blade provides extremely smooth and even blending, while its protective blade guard helps prevent splattering. The mixer offers one-handed operation with its lightweight design, easy-to-grip ergonomic handle, and simple push-button controls. In addition, its long shaft reaches into pots, pitchers, and bowls for extended blending options, eliminating the need to dirty extra dishes. For quick clean-up, the blender's detachable shaft is dishwasher safe and the smooth surface of the blender body wipes clean with a damp cloth. A durable, plastic mixing cup with measuring marks is also included.